It&apos;s Time for Hoopfest 2018! This is it folks! March Magic Hoopfest is back, and I, for one, am really excited. Why? I&apos;ll tell you. Because this time of year we are barraged by basketball - from the big NCAA tournament to the professional ranks to the prep teams fighting for supremacy - but it’s still too cold to get out in the driveway and shoot around, or challenge your buddy to a game of around-the-world. 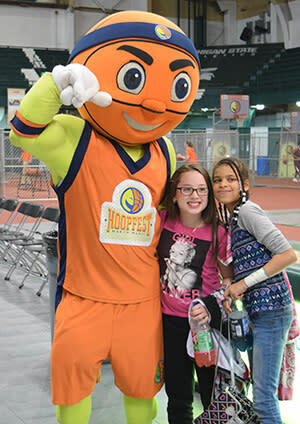 Hoopfest is a sure sign of spring and brings that feel of a basketball free-for-all indoors. Yup, inside the warm and toasty, popcorn scented confines of Jenison Field House, Hoopfest offers an open playground of basketball activities. Here&apos;s my open invitation for you to come on over and play. From around-the-world to a three-point shootout to a half-court shot and a slam dunk area, there are a bunch of different ways to scratch your itch for some basketball fun. We&apos;re all ready for spring but it’s just not warm enough out yet. We&apos;ve been locked inside all winter and no matter your age, after a long enough period of time indoors you just get the itch to get out. It&apos;s like being a kid and chomping at the bit for recess. That&apos;s a lot like what Hoopfest feels like to me. Recess. That&apos;s a pretty sweet notion as I&apos;m in my 40&apos;s and havent been "let out to play" in a long time. Okay I&apos;m in, how does it all work? the event takes place March 22-24 and is open from 2 to 7 p.m. on Thursday and Friday and 10 a.m. to 6 p.m. on Saturday. Come on in free with your valid 2018 MHSAA Tournament ticket, all others just two bucks each. Getting excited? You should be! Here&apos;s a layout of all the things you can expect. Just like the NBA! This three-point challenge tests long range shooting skills from behind the arc. See if you can sink 12 shots in 30 seconds. Top point totals will be posted each day! Can you sink a long-distance game-winning buzzer beater? Here’s your chance! This is a playground classic! Just like around the world but set to a timer. Who can get around the fastest? First one back home is the winner. Can you dribble and dish the rock like Earvin Magic Johnson? Show your best ball handling skills and bring the magic back to Jenison! Everyone loves to see a great dunk. Here’s your chance to fly. Three dunks per turn. Here’s a place for our future stars to play. Stay if you want - only requirement is to have fun!